1) Summer dates – I plan to let this handy list inspire a fun summer of lovin with the boyf! Wineries? Romantic picnics? Yes please! 2) Blake Shelton eating sushi for the FIRST time. How is it even possible people who have never tried sushi still exist?! Either way – I nearly peed my pants at how funny this video is. If you’re having a case of the Monday’s on this lovely Tuesday morning – stop everything and watch this. 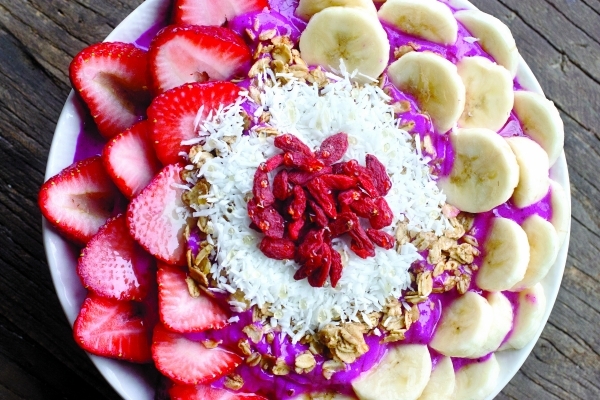 3) Starting the day with a beautifully delicious Acai Bowl. Ever since we came back from Hawaii, I just can’t get enough of these. I love mixing in some protein powder and spinach (trust me) and getting uber creative with my toppings! 4) If you follow me on Instagram, you’ll know I am legit OBSESSED with Buff Bake – and they really hit it out of the park with the new Cake Batter flavor. Slather that ish on everything from bananas to rice cakes and I’m a happy, happy camper. 5) Summer reads. Normally I love curling up in bed with a great novel – but in my ever long quest to become more and more knowledgeable on living a healthy and balanced life, I ordered and cannot wait to sink my teeth into this read. Written by a physician, this book explains how making simple plant-based choices can help us all live a happier and healthier life. Once I make my way through it all I’ll be sure to post a review and share my learnings! I hope everyone had a happy and safe long holiday weekend!